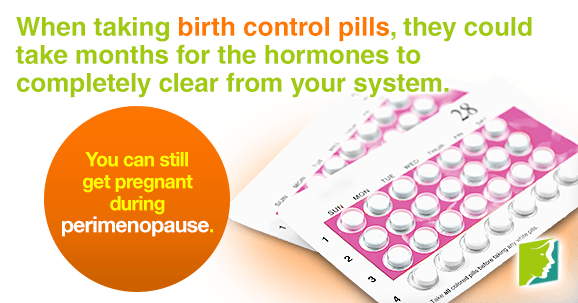 Many women who are approaching menopause continue to take birth control. Read on to learn more about how long you should continue taking birth control, when you can stop without fear of pregnancy, and the effects of taking birth control during menopause. The short answer is yes. Until you have gone a full 12 months without your period, you are still ovulating and can get pregnant. Remember that after going off the pill or other contraceptives, your body may need time to readjust to its normal cycle. You should not assume that because you haven't had a period a month after you stopped birth control that you are menopausal and can't get pregnant. How Can I Know If I've Entered Perimenopause on the Pill? If you are taking birth control pills, perimenopause is virtually unrecognizable. However, a blood test can reveal the level of follicle stimulating hormone (FSH) in your body, which can indicate whether you are menopausal. Be aware that hormonal birth control methods may impact a number of the tests for menopause and render them inaccurate. Can I Continue Taking Birth Control Pills? The choice to continue taking birth control pills is entirely yours; however, it's always a good idea to see what your doctor thinks is best. If you wish to transition away from hormonal based birth control, you may want to consider the following options. Are Oral Contraceptives Harmful at This Stage? Not necessarily. However, keep in mind that your natural body chemistry is shifting at so it may be necessary to adjust the dosage. If you're concerned, talk to your doctor. If you are ever concerned about menopause or your ability to take hormonal birth control during the transition, consult your doctor or health professional. Hormonal changes during menopause can also cause a range of symptoms, some of which may be aggravated by using hormonal birth control. Click on the following link to learn everything about the 34 menopause symptoms.